I put together this guide to give you my best recommendations on what to wear to the cu chi tunnels. 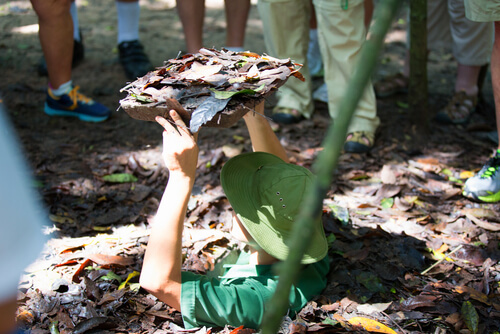 Read on in the rest of the article to find out why we think a shirt, pants, and sneakers are the best option when going to the cu chi tunnels. 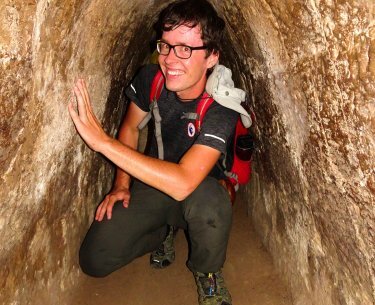 My first trip to the Cu Chi Tunnels actually came after I had already been living in Ho Chi Minh City for a few years. In all honesty, my friend and I were up pretty late the night before having some adult beverages out on the town. When 8 am came, it was time for us to meet our tour guide and open air jeep for a tour to the Cu Chi. I stumbled out of bed bleary eyed and still tired, I quickly grabbed some simple clothes out of my wardrobe, slipped my feet into my flip flops right before heading out the door. I wish I had thought ahead and prepared some better clothing options especially my shoes. The Cu Chi Tunnels does not have a dress code, but I have learned the clothing you should wear would be a simple top or t-shirt, jeans or shorts, and sneakers. 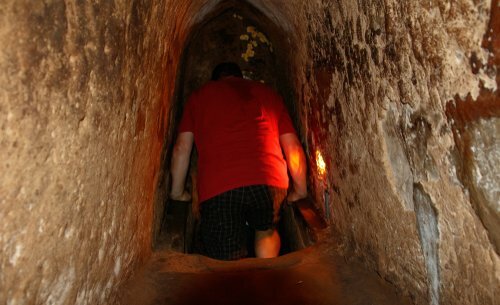 The clothes you bring for the cu chi tunnels should also be old. Everything you wear you shouldn’t mind if it gets dirty or sweaty, because it will. Do not bring a large bag for your trip as it will be difficult to bring through the tunnels. What kind of Shirt to Wear to the Cu Chi Tunnels? Super simple but something a bit dark that won’t stain up if you get it a bit dirty. You don’t want to wear your brand new or favorite shirt on this day trip from Ho Chi Minh. As you pass through the underbrush of the jungle you’ll be brushing up against mother nature which could leave some dirt and stain marks. Even more obvious though, is when climbing through the tunnels you are gonna bump up against dirty walls that are gonna make you a bit messy. If you did bring a small bag, I would consider keeping an extra t-shirt to change into on your way back home so that you aren’t as dirty and smelly during the 2 hour trip back to Saigon. Why wear pants or jeans to the cu chi tunnels? After living in Vietnam for such a long time, I have learned the valuable lesson of wearing pants or jeans even when the weather is hot. If you looked at most photos of Vietnam you would see that everyone is wearing clothes that cover large parts of their arms and legs. This isn’t out of a shyness about showing off skin, but rather to keep skin out of the sun. This lesson can be applied to running around at the Cu Chi Tunnels, some pants or jeans are gonna help keep bugs and sun off of your skin. It will also be a bit gentler on the knees if you crawl through the tunnels. Hopefully you brought a pair of pants that you can use on some adventure tours on your trip to Vietnam. Won’t my jeans get ruined if I wear them crawling around the tunnels? I wouldn’t worry too much about that if you’re not going to rough through the tunnels when on your hands and knees. Just take it easy, what will happen is your gonna get a little dirt on your jeans but if you aren’t cruising like a toddler who has mastered crawling, everything should be just fine! Does that mean I shouldn’t wear shorts? No, not at all. It’s just a suggestion since you will be crawling on your hands and knees. Jungle foliage will brush up against you a little bit here and there. Also, some of us are more susceptible to being bit and bothered by bugs than others. If you love shorts, which I personally wear 95% of the time, then go ahead and rock some shorts when you visit the Cu Chi. I would just recommend not wearing Basketball shorts that are loose fitting as it seems a bit easier for bugs to get into or dirt to find crevices to fall into. When I wore a pair of gym shorts on my first visit, I honestly just felt like they were gonna come off as I was crawling around the tunnels, so I wouldn’t suggest them. How about wearing sandals or flip flops to the Cu Chi Tunnels? Sandals were my first choice when I made the trip the Cu Chi with my friend. She had a solid laugh a few times on the trip while walking around the jungle foliage I was slipping around. We had a little bit of rain that day which made everything a slip and slide for my no grip sandals. I just kept picturing me slipping on some of the loose dirt and leaves to find my backend sitting in a muddy puddle. That would have been a fun ride home! So, my recommendation is to put on a pair of sneakers or slip on shoes to avoid any of the issues I had. It’s a fun day of hanging out in the underbrush of the jungle outside of Ho Chi Minh City, better to dress the part from head to toe. What to Wear to the Cu Chi Tunnels if you think it’s gonna rain? This is probably gonna happen if you are visiting Southern Vietnam in between May and Early December. If you aren’t sure about the weather in Vietnam, you can read up about it at our best time to visit Vietnam weather article. Honestly, I think if you are following this guide, I would wear exactly the same things recommended above. Here is a little trick for you though as someone who has been around Vietnam for a while. If you wanted to bring a smallish backpack that you only put sandals in, this would be great for you to store your wet shoes and socks in while you slip your sandals on during the trip back to Ho Chi Minh City. What else Should I Pack into my Bag for the Cu Chi Tunnels? Be careful when bringing a bag to the Cu Chi Tunnels because you are gonna have to carry the bag through the tunnels with you. Packing some bug spray would be a great idea as there are a lot of insects in the Cu Chi area. Last but not least, be sure to pack some suntan lotion for the trip. Taking care of your skin will be important no matter where you are visiting in Vietnam.